^  GENOV, R., & KALKANDJIEVA, D. (2007). Religion and Irreligion in Bulgaria: How Religious Are the Bulgarians? Religion and power in Europe: conflict and convergence, 257. ^ Ramet, Pedro and Ramet, Sabrina P. Religion and Nationalism in Soviet and East European Politics, p.20-21. Duke University Press (1989), ISBN 0822308916. （英語） Herbermann, Charles, ed. (1913). "Bulgaria" . Catholic Encyclopedia (in English). New York: Robert Appleton Company. 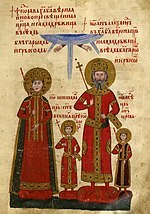 History of Bulgaria and the Bulgarian Orthodox Church according to the Catholic Encyclopedia (1913).